Wood selection is, as always, important. It needs to be straight and as knot-free as possible. For this saw we used a 10’ ash sapling, but there are many other suitable species including hazel, willow and sweet chestnut. The section that you choose should be at least a couple of inches thick in the centre. 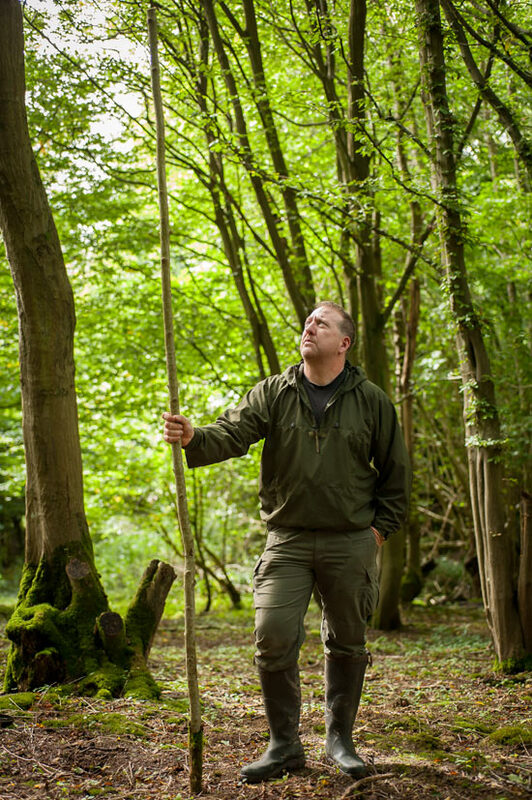 Place the sapling on the ground and, using your foot to hold the centre, start to bend one of the ends upwards. As we are not using heat to loosen up the lignin (the natural structural material which lends rigidity to the wood) this process needs to be slow. Have patience and don’t rush. Turn around and start the bending process from the other end, working until the wood feels as though it is becoming more pliable. Once the bend is established, both ends can be pulled slowly and gently upwards. Moving your feet from one end to the other and rocking the wood as it bends helps to create a more even curve. Moving the sapling onto its side can give more control during the later stages of the process. Keep measuring the blade against the curve so that you know when you have achieved the correct diameter. Once the correct diameter has been achieved, take a length of cord and tie it several times across the diameter of the arc. Put a windlass between the lengths of cord and turn it to bring the curve into its final position. The windlass may then be locked off by allowing it to rest against the top of the frame. Use the blade to measure the correct position, then mark and remove the excess ends of the wood. Use a knife to split the ends of the saw frame, then slot the blade into the splits. This may take a little fiddling to get right, but take your time and mind your fingers on the teeth. Put a strong peg through the holes in either end of the saw blade and carefully release the windlass, removing the cord as soon as it is loose enough to do so. You can see that the tension in the frame is powerful enough to bend the pegs, so caution is needed. Fencing wire or even a nut and bolt can be used instead if you prefer. The finished bow saw is now ready for use and proved to cut strongly and efficiently. Thank you for sharing this very detailed tutorial! 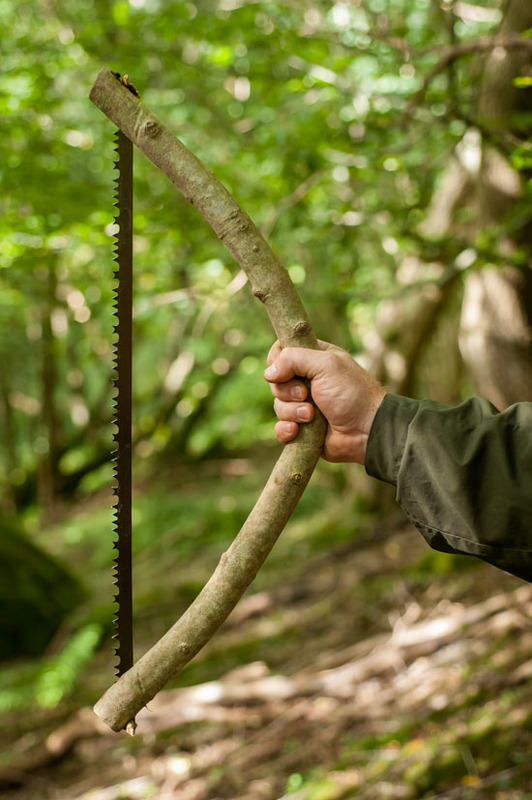 I will try to make an hazel bowsaw on my next hike! Ciao Woodlore! This is a great pictorial/article. I have a Sven folding saw I bought years ago for practicing survival skills and I rarely take it with me because of the extra weight of the handle. This is a great idea for just taking the blade. I love the fact that the sapling pulls the blade from each end and keeps the blade tight. When I’ve tried using a method like this, my blade flopped around too much. The windlass to keep the bend in the bow and at the same time keeping the split from running up the sapling is great too. Thanks for this great survival tip!